Location : Avinashi near Coimbatore. This temple is 15 centuries old, constructed by Sundarapandiya is closely associated with the great Saiva saint Sundaramoorthy Nayanar. 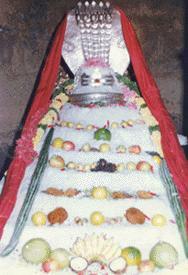 On his way to meet Cheramaan Peruman, nayanar happened to visit Avinashi. As he was passing through one of the streets, he heard two discordant notes coming from opposite houses, one echoing joy and another sorrow. The puzzled saint understood the cause for the strange phenomenon. The incident took place some three years ago. Two boys of the same age went to bathe in a tank from which emerged a crocodile and devoured one of them. There was being celeberated the "Upanayanam" (Thread ceremony) of the surviving boy, now 8 years old. Hence there was joy and mirth in the house. While the other people were unable to bear their sorrow. Had their boy been alive, they too would be celebrating his "Upanayanam". Intensely moved by this, Sundaramoorthy Nayanar poured out of soulful song, praying to Lord shiva to resurrect the dead child. His prayer was answered .The empty tank started surging with water from which emerged the crocodile and ejected the child as a fully grown boy of 8 years. 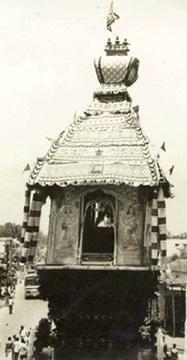 The car festival is the most exciting of the festivals in this temple. This temple's car is one of the biggest in Southindia and is noted for its fine wooden carvings.Since the old car was destroyed by fire recently,it has been rebuilt.